Homemade Croissants. Pain au chocolat. Things that terrify, mystify, impress. Things that intrigue me, beg me to bake them, taunt me from the recesses of cookbooks and foodie blogs, “Try me, I dare you!” So I did. Homemade croissants have long been on my list of culinary “musts” and have remained there on that list for my fear of failure. Ridiculous, I realize to be afraid of a silly little laminated dough. It helps to know I’m not alone, which I read scrolling the commentary following most every croissant recipe post from the brave and daring who went before me into croissant territory. This recipe is simple, but involves your time and attention. 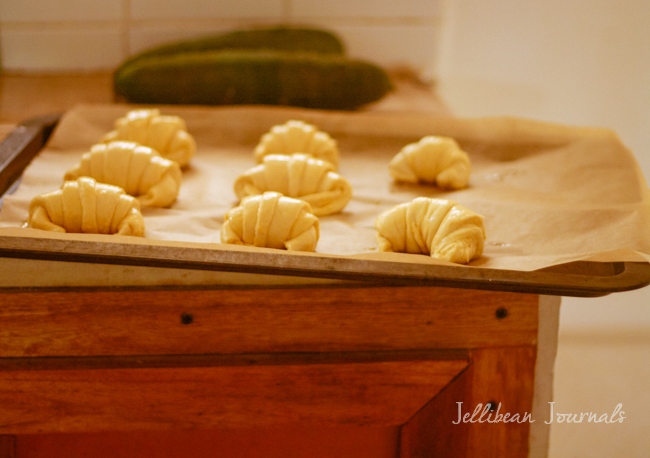 These homemade croissants were everything I’d hoped they’d be: flaky, buttery, scrumptious, and light. They weren’t at all greasy and though I made a few mistakes with the dough rolling, every single one came out of the oven looking picture perfect. If you want a lightning fast solution, you’d be better off with these quick but chic chocolate pastries. If you have doubts about your abilities in the kitchen like I did, you will soar in the clouds with pride (the good kind!) after removing these special treats from your oven. I think I smiled for 3 hours just thinking about this success. Warning: You WILL want to eat one, two, more so be sure to have another person around with whom to share your scrumptious homemade croissants. 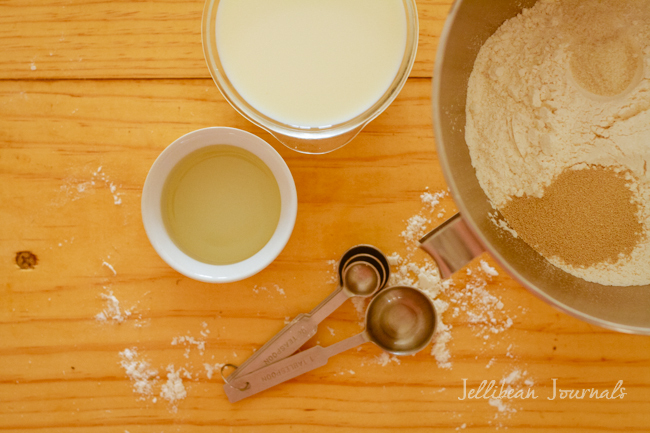 Combine all ingredients except butter in a stand mixer fitted with dough hook. Mix on low for 3 minutes until combined. Dough will be very moist. Scoop into a buttered bowl and allow to rise for 1.5 hours. Slice each butter stick in thirds and align them on a sheet of plastic wrap to form a square. Beat them a few times and roll into an 8x8"square. Refrigerate. Remove cold dough from refrigerator. Line 2 baking sheets with parchment paper. Divide dough in half, refrigerating half while you roll out the other half to a 6.5x20" rectangle. Cut into triangles and tightly roll up from the wide base edge. Place 2" apart on baking sheets. Beat egg and cream to make an egg wash. Lightly brush over croissants. Allow to rise 1-3 hours or until puffed a bit. You may not notice a huge size difference at this point, but the croissants should wiggle a bit if you shake the baking sheet. Preheat oven to 375F and bake 25-35 minutes, or until golden. Serve warm. 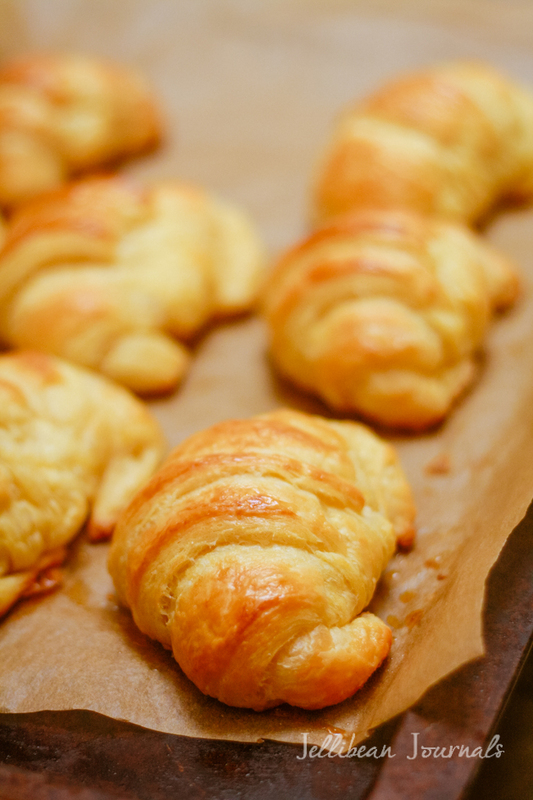 Leftover croissants may be frozen and reheated for 8 min. in a 350F oven. Check out his easy-to-follow technique! Make sure to flour your rolling surface. Trust me! For pain au chocolat, cut the final dough into rectangles, place a small piece of chocolate inside, and fold into thirds, or roll up. Or take this shortcut. What baking challenge would you like to see next? Fill me in down there in the comments! I love these, Jelli! 🙂 My son’s favorite thing from Panera is their chocolare croissants! He would love these. And yes, these are also one of those things that I have wanted to try and make from scratch, but I am so afraid of screwing them up! Thanks for sharing this recipe! Gosh, my Panera days during university seem like such a long time ago now. I’ve gotta admit, I’ve never tried their chocolate croissants, but I’ve got the hunch that popping some of your favorite chocolate inside these would be even tastier. In all seriousness, Carrie, you’re a superb baker and you’ve got absolutely no reason to fear croissant making. It’s super easy, just takes some time. Thank you for stopping by this weekend! Hi I just tried making these and let rise but it didn’t rise at all…. Do I need to mix the yeast with warm water first and then add to ingredients? Amy, I’m so sorry they didn’t turn out for you. I don’t generally mix the yeast prior to adding it to the dough, since the rise time in a warm place gets it puffy for me without that extra step. It might depend on the yeast you’re using. If in doubt of the age of the yeast or it’s activity, definitely go ahead and premix the yeast with the warm milk and sugar 5 minutes before adding it to the rest of the ingredients. Hope it turns out better next time. I used active dry yeast and didn’t mix it with warm water before adding. Just mixed it with dry ingredients and added the milk and oil. Mine also didn’t rise during that 1.5hr but I didn’t want to give up. I kneaded it again, refrigerated overnight, and it rose into a beautiful dough then. Then I followed the videos directions of folding in the butter. It made perfectly crispy layers with the eggwash. I might try using less butter next time. Seemed like too much. But this was a great recipe! Glad you were savvy and found a way to make the dough rise. I love a good overnight rise on breads- it just makes it a little more tangy and delicious and ultimately easier to shape too. Glad you had success! I’m in the process of making these now but the instructions don’t match the recipe. He says 16 1/2 tablespoons butter but the recipe calls for 24 tablespoons butter. The baking time is also different. I’m still anxious to see how they turn out. Pictures look GREAT. Hi Eunice, how’d the croissants turn out? I don’t use his recipe here, just his instructions for folding the dough. Sorry about the confusion. I appreciate it, Jessica. To be honest, had I not made these for guests, most likely I’d have scarfed down half the baking sheet too 🙂 Thank you for sharing. I’m just beginning with Pinterest and need all the help I can get. Have a super week. Oh your croissants look AMAZING!!!! They look so light and flaky!!!! 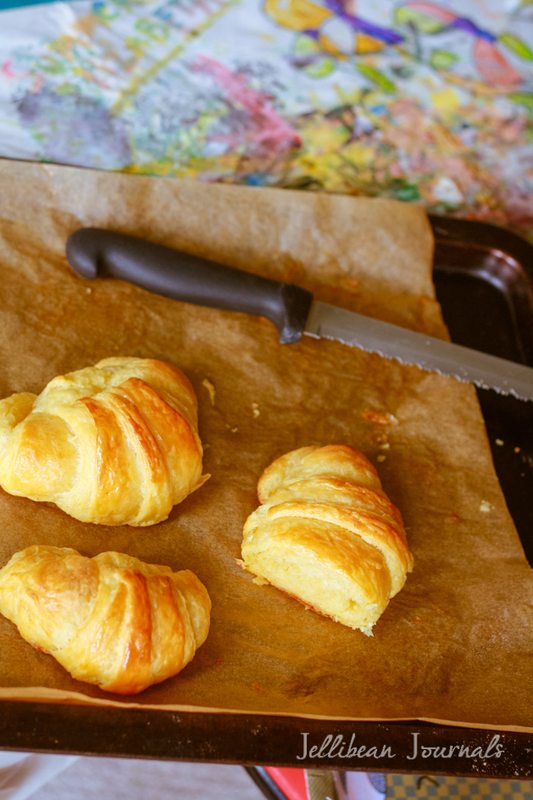 There’s nothing like a good croissant, especially homemade! These look fantastic, and I wish I had one with my afternoon tea right now!!! Maria, you’re too kind! Homemade croissants are the best, right? I actually made these for the 1st time about 3 years ago when I couldn’t find a good croissant sold anywhere but in a beachside cafe FAR from my house. I was craving a delicious accompaniment for my coffee and made these. It’s been love ever since! Thank you so much, Brenda! You know, the best part about these croissants was when I found out that they freeze and reheat tasting 99% as good as freshly baked. Yum! These look GREAT!!! 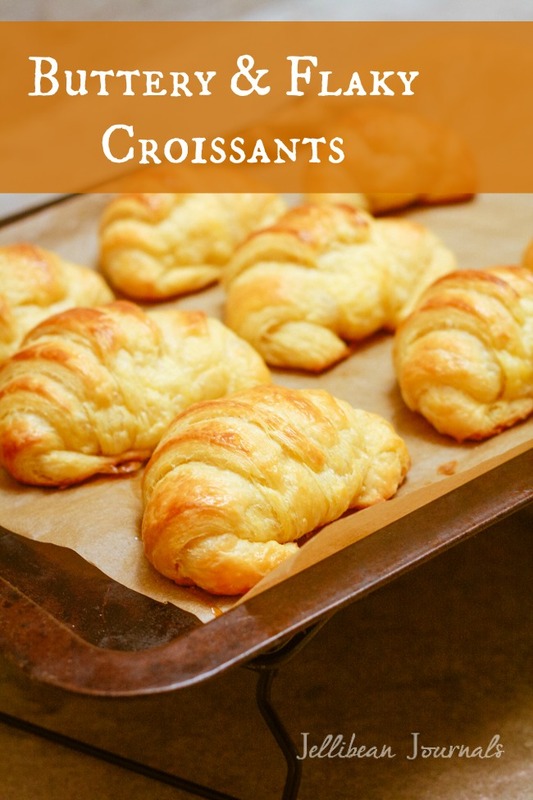 I just may have to try making these…my son really likes croissants and I know these would be his favorite! Go for it, Diane! Your house will smell divine and your son will be smitten as can be. If you make them over the course of 2 days like I do, the work doesn’t seem too cumbersome and the outcome is beyond belief good! Thank you so much for visiting. I am so jealous! I am terrified to try homemade croissants! If I can do it, anybody can. Croissants seem like such a difficult pastry, when they’re really quite easy if you follow the instructions and dedicate enough time to the endeavor. Go for it, Julianne! This is the ONE thing I’m terrified to make. Your recipe makes it seem possible. Thanks for sharing! BTW I found you at the pincentive link party, and this post looks like a real winner! I know exactly what you mean. The first time I tried croissants I was hoping they’d not be a disaster. Turns out, even my first attempt was a success, and back then I was much more a novice. I’m convinced that anyone can make a killer croissant if they dedicate the time and read the instructions through a few times before jumping in. Go for it! Thanks for visiting, Jessica. See you again soon. This immediately got pinned! Yum. I can’t wait to try these 🙂 Found you on Whimsy Wednesday linky party! Doing a happy dance, Kelley! Thank you so much for stopping by to take a peek at the croissants. Hope you love them. See you around again soon. 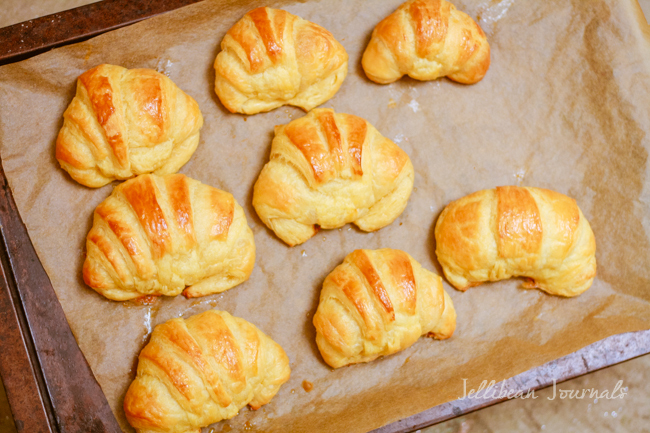 Oh my goodness … your homemade croissants look absolutely perfect! I guess I’m going to have to try my hand at these … they’d be perfect for my chocolate-stuffed croissants! Thank you for stopping by, Kimberly. These croissants are the perfect vehicles for chocolate. I’ve done it a few times and they are divine. Let me know what you think once you’ve baked them. Have a great week. Clarissa, you won’t ever go back to store-bought once you sink your teeth into these, trust me! They’re a super easy way to impress company and can be filled with all sorts of things to mix it up a little…chocolate is my fave! Thank you so much for loving on my recipe tonight. See you around again soon! Pinning this! I’ve always wanted to learn how to make croissants! Awesome, Gabby! You must tell me how you love them when they come out of your oven. Thanks for sharing. That’s pretty awesome that you made these from scratch! I’m yet to muster up the courage, but looks so good Jelli! I just made and posted croissants today. Now, I see yours. They look great. Thanks for sharing. Croissants make the world a better place, don’t you think? I love them! How do you serve croissants, Peter? Sandwiches, jam, or as is. To be honest, I almost feel like I’m doing them an injustice to fill them with chicken salad or the like since they’re so delicious plain and simple. Thank you for stopping by today! Awesome. I was just thinking the other day about trying to make these. Thanks for the recipe and courage by making it look easy! Stephanie, be warned that once you see how easy it is to make these at home, you’ll want them every.single.day. Literally amazing. Hope you find the time to bake croissants this weekend. Thank you so much for sharing. I know for a fact that I would not be able to eat just one! I am not a baker but would be willing to try these! Thank you for sharing this post and linking up with us at #WWDParty. Antionette, I really love linky party hosts like you that make the rounds to comment on posts. It’s so refreshing amid a bunch of “big” bloggers who host parties and rarely stop by. Hope you find the time to try some croissants. You won’t be sorry! Blushing as I head to the store for the ingredients! I’m visiting from Antoinette’s blog – saw your beautiful link there and had to come see more! Those croissants are so mouth watering I must try some. I normally try keep my pastry intake to a minimum because I could eat them all day but these cannot be passed by! Thanks so much. I’m the same way, Robyn. For the most part I eat healthy foods, but when it comes to croissants, there’s just no way to only have one. Hope you find time to bake a batch soon. Thank you for stopping by. I’ve been looking for a good croissant recipe! Can’t wait to try these!!! Thanks again for sharing and for linking up at the Weekend Wind-Down Party with us!!! God Blesss! Started these tonight… yours look great, here’s hoping mine turn out! Was your laminating process a mess? Mine was! It didn’t look anything like the neat video! Any tips on keeping it neater… I had butter oozing out and my dough vaguely resembled a rectangle. Would love some insight! I didn’t activate the yeast (since it didn’t say that I should) and my dough didn’t rise, is that going to be ok? It is in the fridge now, so I don’t know how it will work out, but I wanted to check and make sure that I wasn’t supposed to activate it? Thanks for the beautiful recipe! Sarah, it should work out A-okay! Hope you fall in love with the croissants. I was actually just daydreaming about making some myself this afternoon. Happy baking! Ok, one more question, do I laminate before I put it in the fridge overnight or after? It’s up to you, but it’s easier to do it tonight and then leave fewer steps to do the following day. I’d do it before the overnight refrigeration to make things easier on yourself tomorrow. Thanks for asking. Hi! I’m already in the process of trying these! I made some assumptions and hope they were correct with the measurements: I assume t was teaspoon and T was tablespoon and guessed my way through the butter based on the video, I used 100 grms of butter ( I live in a different country so butter sticks were hard to come around). So far I hope I’ve done everything right! Everyone is counting on them! Tania, I hope they come out great! You’re right- I need to get the measurements written out more clearly. Thanks for the heads up! You’re going to LOVE these. I could totally use a croissant on this gorgeous rainy afternoon. Thanks for stopping by. Be sure to come back and let me know how they turned out. These look amazing!, job well done! I have a HUGE weakness for croissants, great post! Thanks, Barri! I have got to make these again soon. It’s chilly outside today and a buttery croissant would totally be appropriate with my morning coffee. Thank you so much for stopping by. Seeing your photos yesterday made me go get a croissant fix. unfortunately, I was disappointed with what I bought so today I’m making these babies. Will also try them with the banana jam I just made. Thanks for this recipe! This looks great! There is nothing like creating your own homemade croissants and adding personal touches to it (like chocolate!). I learned how to make it from Martha Stewart one time and I had the show on my PVR for the longest time, but then accidentally deleted it. So, your recipe has me thinking that a yummy Sunday project is in order! One thing – we don’t eat eggs, and I think we used cream and cornstarch to make the glaze – and it tasted just as good. Thanks so much for your compliments. You’re absolutely right about brushing cream on top if you’re not eating eggs. Works great even without cornstarch! Oooh, can you imagine how yummy if you sprinkled the tops with rough ground sugar? I’ll bet they’d be beautiful. I’m from Europe and we are using the metric units, could you kindly indicate me the measurements in grams, please? Or at least a link where I can covert the ones indicated by you? I tried these today. The laminating process was messy to a point where I thought I’m doing it all wrong. The dough is chilling . Baking tomorrow. Thanks for sharing your recipe. And yes it is my first time. Kavita, I hope they turn out great. Laminating the dough is the toughest part, but hang in there, even if they don’t look magazine worthy the first time, they’ll still taste amazing. Don’t distress if your dough weeps butter as it bakes- this happens sometimes if the laminating is a tad messy, like you said. Just be sure to protect your oven from drips by placing a cookie sheet on a rack beneath the croissants rack when you bake. Liyana, you could certainly just skip it or use milk instead. It doesn’t do much more than make the croissants a little more golden and crisp on the outside, so like I said, if you prefer not to use egg, I’d just leave out the step altogether. Hope this helps! Yay!! Congrats on creating bakery treats at home. You’re right- they’re addictive, especially when you realize that they’re not so beastly difficult to make at home. Hope you love ’em with the ham and cheese too! I love filling them with Nutella or jam and whipped cream. Enjoy and thanks so much for coming back to report on your success, Samantha! Hello I made the dough and i cant help but feel like i needed to add warm milk. It didnt rise until I put it super close to my oven that i had to turn on. also when i rolled it out it didnt seem like it was rolling very nice. im not sure if i did anything wrong. My husband keeps asking for homemade croissants and I am terrified! I’ve read that your butter needs to be at least 82% fat in order to laminate correctly. Did you use a special butter? I haven’t been able to find 82% fat butter at any of the typical grocery stores. Thanks! Hi Rachael, I have only 2 or 3 options of butter here in Costa Rica and haven’t had any trouble with using the basic local brand. Don’t fear croissants- embrace the challenge. You’ll be amazed at how simple the process is, it’s just a little long is all. i just found croissant recipes and yours was the friendliest one. I’m a retired nurse and I am finally learning to bake from scratch. I’m going to start this recipe today and surprise my husband! There are so many flour brands out there! I started reading labels thoroughly and discovered most of them have aluminum in them. Gack! Aluminum has been linked to Alzheimer’s in a very specific way! After some informal research, I’ve concluded that many current ailments are results of what we eat. So I love seeing blogs like yours; wholesome cooking and living! (I did finally find the right flour). God bless! Wow, Cathryn, your husband is one lucky lad! So happy you found a quality flour- you’ve definitely alerted me to something I didn’t know about. Will definitely be checking my labels more carefully. Hope your croissants turn out beautifully. From my experience, even if the first time they don’t turn out picture perfect, they still taste spectacular. Thank you so much for stopping by. I’m glad you made successful croissants. Just like you, I also love trying out some audacious recipes. The latest daring recipe I tried was empanada and I was also happy with the result. Mmm! We love empanadas here in Costa Rica, not that I make them much. Nance, what did you use for filling? Thanks so much for stopping by today. I wrote it here: https://leaningonjesusalone.wordpress.com/2015/03/25/empanada-crust-choose-your-own-filling/. Thanks so much for the link. Definitely going to check it out. I’ve been thinking of making these lately….thanks for sharing! Pinned! The Croissants looks yummy! I try to stay away for bread but when I want some bread I am going to try your recipe. Oh. My. Goodness. These look amazing! Cooking is one of the things I really miss since I’ve been traveling a lot. This is definitely going on my list of to-makes for when I get home. My mouth is watering just looking at the pictures. Thanks so much, Megan. Hope you’re enjoying your travels. Be sure to stop back once you make the croissants to let me know how they turned out. LOVE! These look SO delicious! I am totally pinning these and am going to make this recipe!! Can’t wait to hear your feedback from the recipe, Sarah! I’m hoping to make these again this week and add chocolate to the centers. Mmm. Thanks so much for stopping by today! These look so yummy. I’ve pinned the recipe. I bet a lot of people will really appreciate this recipe!!! These look amazing!! I’m terrified, but I’m going to give the recipe a try. Question though- what kind of yeast do you use? Rapid rise or active? Thank you!! I used active yeast for the croissants. Hope you love them! In fact, I might make a bunch this week because I found butter on sale. mmm! These look amazing! My dough is on its first rise as we speak. One question though…do you refrigerate overnight and laminate the next day? Or do you refrigerate the laminated dough?? I usually refrigerate the dough before laminating and then refrigerate between turns the next day. Once it’s all laminated you can use it right away unless it’s too warm and soft. If that’s the case, just pop it in the fridge for 30 minutes, slice and shape your rolls to bake. Yum! Hi, when do you add the square of butter to the dough? Thanks! You layer the butter into the dough by folding the dough over it and enclosing the square. You then do various “turns” of the dough. Watch the video link in the post to help you out! Ellie, I usually use 2% milk for the recipe, though it probably wouldn’t hurt to use whole either. Nothing to fear, Eleanor! You know, as my husband likes to say, it’s all about failing forward if you don’t succeed first go round, though I have confidence that you can make croissants work. Go for it! Hi Jelli, love your recipe. Just took mine out of the oven. They smell and taste delicious. Just wondering., can I freeze the croissants raw or is it better to freeze them ready and how long can I keep them in the freezer? Hi Dana, great questions! I’ve honestly never frozen croissants because we devour them so quickly, but from what I’ve learned, it’s best to freeze them before they rise, as in, uncooked. I know that you can also freeze them baked as well, to pop out and reheat in the toaster oven (or regular oven) if company comes over. It’s really just up to you and what will work best for your circumstances. Hope this helps! Hi Ana, if you watch the video within the post it will answer most of your questions. I hope you find it helpful! I was super excited about making these. Everything went well until I put them in the oven and butter leaked all over around them and was a disaster. Any helpful tips? Hi Kristen, this same thing has happened to me too. It has to do with the step when we incorporate the butter into the dough as well as making sure that the room where the croissants do their final rise isn’t too warm. If we try our best to seal the dough around the butter it will help with the leakage. Also, op to let them rise just a little less time so that the butter doesn’t get too melty. Another alternative is to let them rise in the fridge overnight and them bake straight from the refrigerator. Hi! Your croissants look amazing. I live at really high altitude. What adjustments should I make? Hi Mariana, I live at 1 mile (1.6 km) altitude as well. To be honest, this recipe works just fine here and I’m not entirely certain what you’d need to do to alter it since it involves yeast rather than baking soda or powder. Generally, I think that baking conditions change mainly due to using these two products, but again, I may be wrong. Sure, Laya. There are no eggs in the actual dough. However, there is an egg used to brush over the dough during it’s final rise to help the croissants bake up beautifully golden brown. Enjoy! And 1 last question, what kind of yeast did you use? These croissants look awesome! I was just wondering if I could use WW Flour instead of All- purpose flour? Would the recipe turn out the same? Vivian, that’s a great question. I’ve never tried the recipe with whole wheat flour, though my guess is that the croissants would be more chewy and dense, perhaps even losing the “fluffy” effect that layers of butter create between the dough since the yeast will have to work harder to get them to rise. If you’d like to try it, I’d recommend using no more than half WW to AP flour the first time to see how they turn out. Hope this helps! Happy baking! They look perfect!!!! What would be the measurements if we use active dry yeast instead of regular yeast? To to you the truth, I always use the measures interchangeably with good results. Will most definitely be making these today. They look so delicious. Although I may make a few extra batches so I can make breakfast ones regular ones and maybe even some pepperoni roll ones as well… time to put on the apron!!! Pepperoni rolls! Now, we’re talking. Sounds fabulous, Mattie! flour? Since croissant rolls fall into the bread category. The sugar amount you have isn’t that a little too much sugar? I do not want a sweet roll at all. Hi Heather, I’ve never come across a croissant recipe calling for bread flour, but it would work. Perhaps the croissants would lose a little of their delicate-ness. This recipe works for me, but you could certainly try reducing the sugar to fit your needs. In fact, I have some croissant dough in my fridge right now that I completely left the sugar out of. Hi, what kind of yeast did you use? Was it instant yeast, rapid rise yeast, or active dry yeast? I think the reason people maybe having trouble is because they are not using the right kind. Thank you! Active dry yeast, I believe. Here in Costa Rica we don’t have many varieties to choose from and they’re not always labeled with the specific type. Sorry to be of so little help. Will this work if I replace the butter with something else? I really want to make these, but I would like to avoid using mass amounts of butter (or any at all). Hi Stephanie, thanks for asking about butter subs. Unfortunately, this recipe will not work nearly as well with anything but butter. Nevertheless, you could give it a try with another fat and write back to let me know when you find success!